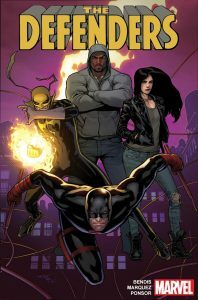 The streets of New York’s Hell’s Kitchen have become over run with crime and corruption, and there is only one group of Super Heroes – Daredevil, Luke Cage, Jessica Jones, and Iron Fist – who are willing to unshackle themselves from the constraints of the rest of the Marvel Super Hero community and fight the villains no one else is willing to take on. Written by EISNER award-winning writer, Brian Michael Bendis (Civil War II, Jessica Jones, Invincible Iron Man) with artwork by New York Times best-selling artist, David Marquez (Civil War II, Invincible Iron Man), prepare for THE DEFENDERS. The toughest hard-hitting heroes of the Marvel Universe stand together as a brand new team ready to take down one of the most dominating criminal empires ever to shadow over New York City. But in a city where leaders of violence and death are all vying for dominance, who is the one criminal despot powerful enough to challenge the saviors of Hell’s Kitchen? Some of the darkest days await Daredevil, Luke Cage, Jessica Jones, and Iron Fist, but THE DEFENDERS are ready to plant their feet, and fight back-to-back against one of the most epic wars the streets of NYC have ever encountered and stand resolute against an attack so personal that it will challenge our heroes at their very core and everyone they have ever cared about. This June, the five boroughs have a new front line of defense. But can the collective strength of Daredevil, Luke, Jess, and Iron Fist have what it takes to protect the “Big Apple?” Find out this summer from Marvel Comics’ THE DEFENDERS. THE DEFENDERS #1 – Written by BRIAN MICHAEL BENDIS, Art by DAVID MARQUEZ & Cover by DAVID MARQUEZ. On-Sale in June!